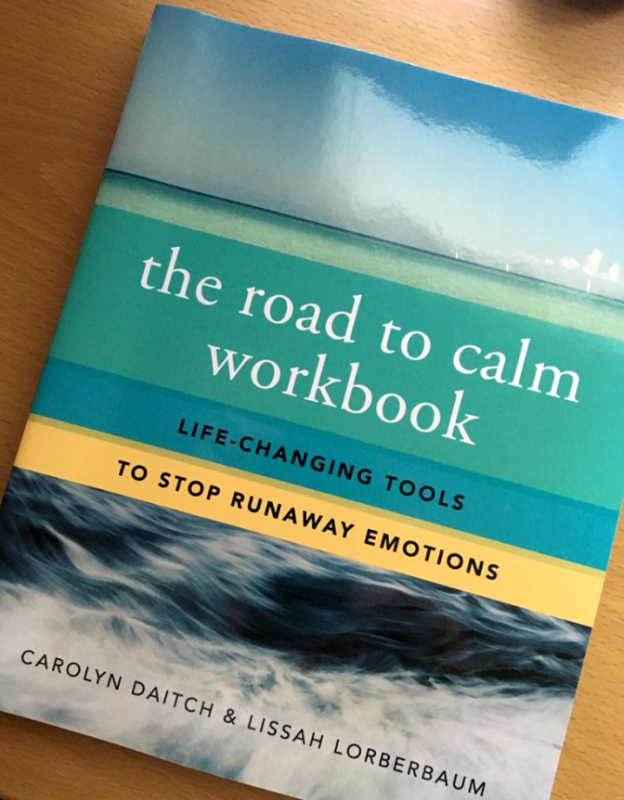 The Road to Calm WorkbookI’ve had quite a few great books sent my way to review lately and the one you see pictured above is yet another winner that was sent my way: The Road to Calm Workbook (Life-Changing Tools to Stop Runaway Emotions) by Carolyn Daitch & Lissah Lorberbaum. Before I tell you why you’re going to love this book, can we just talk about the cover for a minute? You may not know this about me, but I am crazy obsessed with book covers. I think a book’s cover should set the mood and set the tone for what’s coming. I’m so fixated on covers that I actually get a little queasy when someone has obviously failed to think through the cover. When I have a book with a beautiful cover that captures the heart of the book, I tend to like it even more. They say you can’t judge a book by its cover… obviously they didn’t know me! This cover is so perfectly perfect for this book. The colors, the font used for the text, the clouds, the water… perfect times a million. Emotional flooding―being overwhelmed by feelings―happens in response to stress, anxiety, and life’s challenges. In this client-orientated accompaniment to Affect Regulation Toolbox, Carolyn Daitch and Lissah Lorberbaum present skills and tools on how to dial down reactivity, practice mindfulness, and focus positively on the future. Written to conquer a broad range of emotional challenges in easily accessibly language, this book is intended to help clients improve the quality of their everyday lives. The workbook is split into two parts. Part I helps the reader understand when and why emotional flooding occurs. Using vivid stories and examples of others’ triggering situations helps the reader better understand their own triggers, and how to cope with them. Part II provides instructions for “daily stress inoculations,” a daily practice for relaxing and lowering baseline levels of emotional reactivity. The STOP Solution is introduced as a way of learning how to stop or lessen feeling emotionally overwhelmed. STOP stands for Scanning thoughts, feelings, and sensations, Taking a time-out, Overcoming Initial Flooding, and Putting tools into practice. Throughout the workbook, readers will find guided imagery exercises, opportunities for journaling and reflection, mindfulness practices, and matching audio exercises on the accompanying CD. A complimentary companion app (for information, visit: www.bitly.com/RoadToCalmApp) also enhances readers’ ability to take these exercises on the go. The result of this gentle and reliable program is resilience, well-being, and freedom from the emotional patterns that create suffering and damage relationships. The Road to Calm Workbook is more than just a book – it’s more of a guide. The authors will guide you through the road-map of your own emotions. Many times you’ll find yourself thinking, “So… that explains why I react this way.” or “Absolutely – that does make me tick.” Becoming more self-aware is one of the healthiest things you can do for yourself and this book is an excellent starting point. Carolyn Daitch, Ph.D., is the director of the Center for the Treatment of Anxiety Disorders in Farmington Hills, Michigan. A clinical psychologist, she is a certified and approved consultant and elected Fellow of the American Society of Clinical Hypnosis as well a Fellow of the Michigan Psychological Association. A frequent invited speaker around the world, she is internationally recognized for her practical and easy to implement interventions.She has written four books, including the award winning Affect Regulation Toolbox: Practical and Effective Hypnotic Interventions for the Over-reactive Client, which has received international acclaim and was awarded best hypnosis book by the Society of Clinical and Experimental Hypnosis in 2008. Lissah Lorberbaum, MA, holds a master’s degree in clinical psychology with a specialization in somatic psychology and treats affect dysregulation across a wide range of clientele. She is also coauthor of Anxious in Love: How to Manage Your Anxiety, Reduce Conflict, and Reconnect with Your Partner. She lives and works in Los Angeles, CA. When reviewing a book that deals with self-evaluation, self-realization, and other self-oriented topics, I don’t just read the book for myself – I read what others are saying about the book. This allows me to get a bigger picture of the book and its “reach.” In this case, it was almost a necessity because I’m (by nature) as calm as a cat who just got its belly filled with milk and is reclining in the sun. Naturally, stressful moments move me – as I’m a content cat, not a dead one. I found this book to be a fantastic and enjoyable journey, but I couldn’t help wondering what others thought. When I read other reviews, I found that many people who suffer from anxiety, stress, bad tempers, discouragement and other emotions found this book to be like having a visit with a “therapist” or an old friend. I found that to be fascinating, but not surprising, because the authors have done a wonderful job of putting exercises together with information to help guide the reader to a clearer understanding of their emotions AND how to get the upper hand with these emotions. Click through and read more about The Road to Calm Workbook (including the testimonies and reviews left by others).